To a lot of people, the bedroom resembles little more than its primary function. It’s where you sleep, it’s where you wake up, get ready for the day, dress, and leave. But a bedroom should be a lot more than that. It should be your own little personal slice of peace in the home, an out-of-bounds sanctuary when you need space to focus or just to de-stress. To that end, you have to ask if your bedroom is really fit for purpose or if there’s more you can do to personalise it. Naturally, you can’t talk about the bedroom without talking about the bed itself. Most people choose a bed first and foremost based on practicality. While that should always have the final word in what kind you choose, you should also consider what speaks to your personal style. *Designer beds don’t just look great. They look like the kind of place you’ll be glad to tuck in at night. Getting in that relaxed, pleased headspace is crucial to getting a good night’s sleep. A bed can fit your needs as well as your tastes. Many designer options, for instance, also include extra storage space for those who need a little place to put the clutter before they turn in for a sleep. As mentioned above, a bedroom is more than somewhere that you sleep. It’s your very own space in the home. It should be uncompromisingly you, as well. Are there some things you wouldn’t want to display because you would be worried about how it might clash with the style of the rest of the home? Then the bedroom is the place to include it. It can be deeply personal things like a photo display of some of the most important moments in your life. Or it can be some of your favorite signs bearing mantras and sayings that you’re glad to come back to time and time again. Your home should be full only of the things you love and the bedroom gives you the perfect opportunity to display. Not just the bits of your identity that you want your walls to reaffirm. The bedroom can also be the part of the home where you can freely display the love for the hobbies and activities that make up your life. If you’re a reader, for instance, a little shelf containing all your favorites might add that warm, familiar touch to the bedroom. If you love music, you could arrange a display of some of your all-time greatest record covers on the wall. There are plenty of ways to DIY your décor dedication to your hobby, as well. You can repurpose the old tools that fueled your passion and immortalize them in the room. When it comes to home décor tastes, we spend a lot of time thinking about what we can see first and foremost. However, when it comes to creating a space that you can really feel at peace in, then you should be thinking about hitting the other senses as well. Perhaps most powerful of all is the sense of smell. We all know how there are few better scents than lavender to help you sleep at night. But what about creating a relaxing haven in the day? If you prefer a lighter, more energetic mood, then bergamot orange oil can add a zesty scent particularly great for summer. Mint and pine, on the other hand, can give a drab room a sense of natural freshness that’s uplifting and pleasant, too. 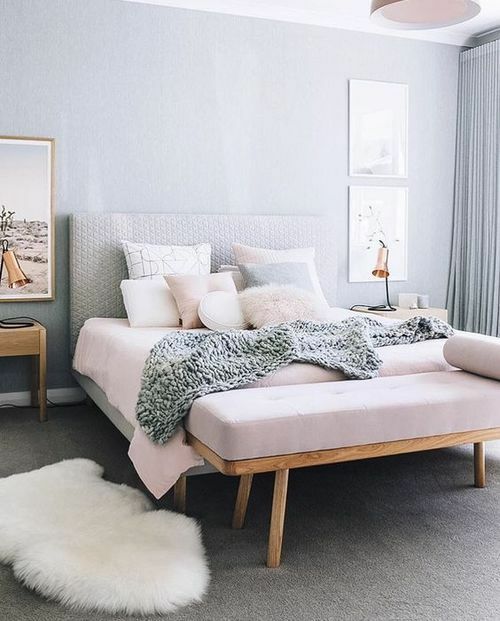 If you’re having trouble putting together all the different pieces of the bedroom, then perhaps a theme might be the best place to start with. When choosing color schemes for a bedroom, for example, don’t start with the walls that will immediately limit the other décor choices you can make. Instead, go with the bed and with a few varieties of bedclothes and extrapolate from there. From there, you have a base to accessorize with, matching the window treatments, the lamp, the tables, the throw pillows to that base. Pick a motif that you’re glad to look at time and time again, however. Gimmicky themes like a big cat spot motif can get tired very quickly unless you’re very, very into them. A personalised bedroom isn’t just a place to go to sleep at night. It’s a place to relax, where you can really battle and let go of the stresses built up during the day. Which also then leads to a better night’s sleep.